Koh Samui is Thailand’s luxury island (Here is my guide to the best luxe hotels in Koh Samui). There are more luxury hotels per square kilometer here than anywhere else in the country with brands like the plush Conrad (read my review here), fancy Intercontinental, Banyan Tree, eco-luxury Six Senses, cool The Library and modern W filling the hilltop shores of this tiny island in the Gulf of Thailand with pampering luxury and concierge services. The best way to explore the island and indulge is by taking it easy and spending 4 days in Koh Samui following this itinerary which combines a bit of island land, diving, food and culture. How many days should you spend in Koh Samui? Koh Samui can be accessed through the very boutique and cozy airport served by Bangkok Airways and a few other regional airlines. Passengers are transported to and from the planes on pretty trams and the lounge area is made of a village-style set of buildings with shops and cafeterias on the ground floor. The departures lounge even offers free internet and refreshments to passengers. This is one of the most exclusive and pretty airports in Southeast Asia and it already tells you something about the type of visitor coming to Koh Samui. There are two types of visitors coming to Koh Samui: Long weekend travelers coming from other parts of Asia, especially from Bangkok and Singapore, and long-haul visitors coming from Europe or Australia on a longer Thailand vacation. When deciding how long you should stay in Koh Samui for I would consider the following guidelines. 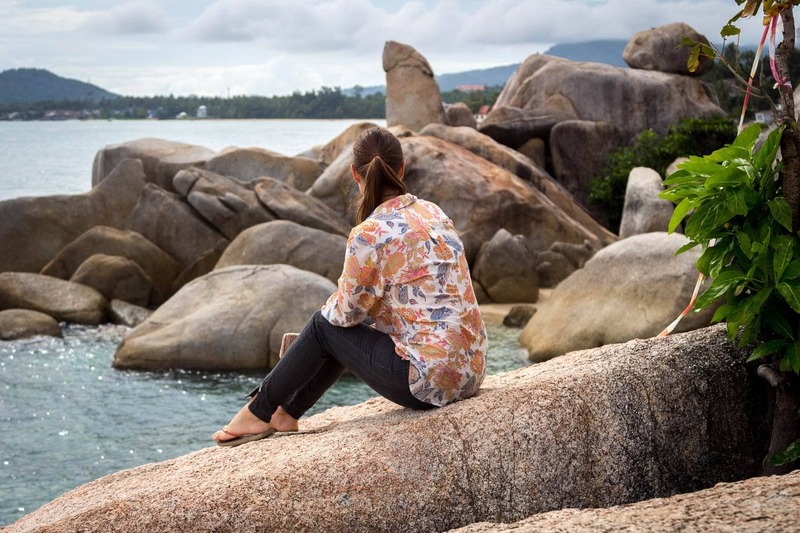 Ideally, if you want to combine a bit of culture, sightseeing, relaxing and enjoying the water and maybe the surrounding islands, I would recommend spending four days in Koh Samui and this itinerary is just a great way to get started in planning your trip. Arrive at the airport and pick up a rental car to have the freedom to explore. Head South via the Eastern part of the coast. Stop at the various sites on the East including Chaweng Beach and the Hin Ta and Hin Yai Rock formations. Have lunch at The Cliff for great bay views. In the afternoon, head out to the Na Mueang Waterfalls for a refreshing dip and Wat Khunaram, the Mummy Monk. This morning, enjoy a leisurely breakfast and some activities at your resort. Perhaps you want to join an early yoga lesson or a tai chi session. Relax by the pool or the beach and take it easy. Koh Samui is best experienced with an umbrella cocktail under the warm sun. In the afternoon, book a tour to the Five Islands complete with a beach cocktail and dinner at the Five Island restaurant. You will learn the ancient art of harvesting bird nests. On your first day, depending on what time you arrive, you should be able to drive around the island to explore the Eastern side. There are a few places you could stop at for as long or as little as you would like. This is the nicest beach on the island and the only one that will make you think of Thailand’s images in your mind. You could spend some time there but chances are you are already staying at a nice resort where nobody is trying to sell you something. These rocks will make you smile. I will say nothing more and will let an image speak a thousand words. The boulders and rocks have an interesting shape. Nice restaurant with 180 degree views over the bay and a good break for lunch over the verandah. The two tallest waterfalls on the island are a typical stop in most of the island tours. However, beware, the trek up is steep and the area is very touristy. You can take a 4×4 or an elephant up. I strongly discourage riding an elephant because I do not support the way in which these gentle elephants are abused to break them down and tame them to carry tourists. They are wild animals not made to be domesticated. The water may be murky in the rainy season so not so suitable for a swim and the parking area full of stalls selling souvenirs. Mixed feelings here. I would give it a miss but decided to include it here for reference as it appears as one of the key things to do in Koh Samui. This Buddhist temple is best known for being the shrine of the mummified monk Luang Pho Daeng who died in 1973 and wanted his body to be displayed as a reminder of the temporary existence of the human body. It is said that he died during meditation. There is often other monks around to offer blessings. You came to Koh Samui for the sand, sea, sun experience so it is only fair to spend the good part of one day lounging around with an umbrella cocktail in your hand. In the afternoon, if you find the courage to leave the resort, book a tour to Five Islands. Although pricey, you will get the chance to take a tour to see the harvesting of birds’ nests. The swifts build their nests on the precarious rocky slopes of these islands. The islands are uninhabited and protected from poaching. The name in Thai means Four Islands – Five Islands, as one of them is hidden. 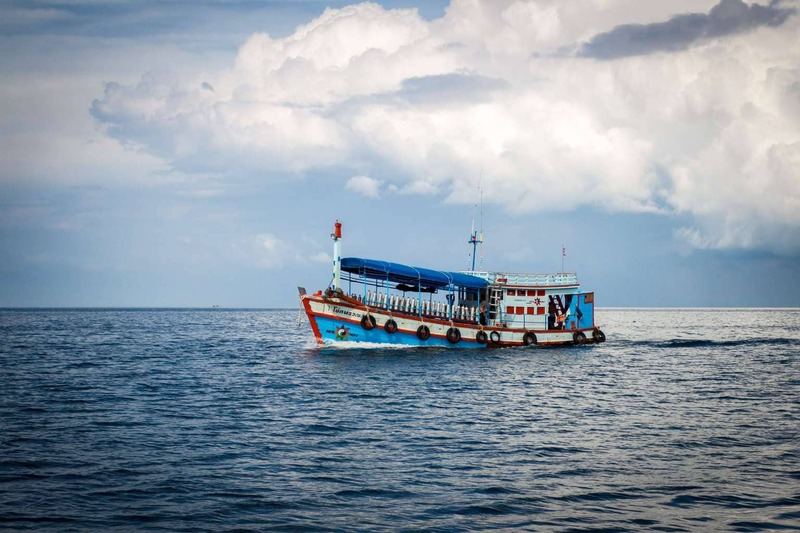 The tour usually takes tourists on a wooden long tail boat to spot the nests and some hidden beaches and limestone cliffs and there is the opportunity to snorkel. You could take the tour in the morning and end with a lunch back on the beach but it is much nicer to do it in the afternoon and enjoy a romantic seafood dinner on the beach. There are two full day island tours you can take to the outer islands. 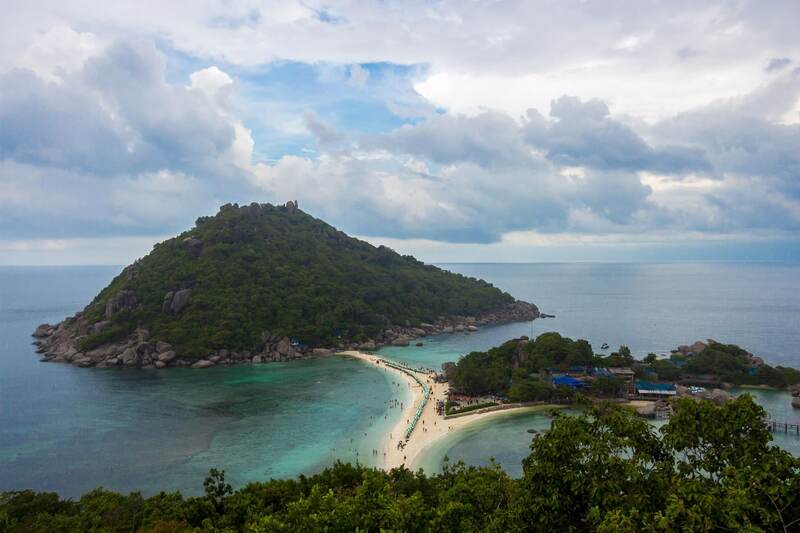 From January to October, the Ang Thong Marine National Park is open to visitors. There, you will be able to climb up (literally so bring proper shoes) to a viewpoint to see the Emerald Sea, a lake of the same color that is not accessible to humans due to conservation reasons. You can see it from the top of a hill on Mae Koh. Tours to Ang Thong usually include lunch on Koh Paluay, a sea-gipsy village, and kayaking around the island. In the remaining two months of the year, November and December,, the waves are too strong and the park is closed off. 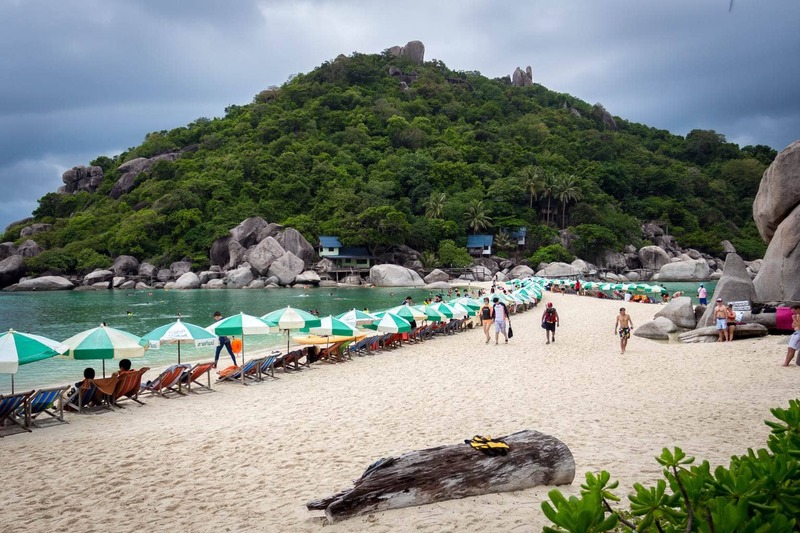 Despite the high risk of rain, you can choose to take the other available tour to Koh Tao and Koh Nangyuan Islands, the famous islets with a line of popsicle umbrellas pinching the white sand strip that feature on every image of Koh Samui. They are actually next to Koh Tao and about an hour and a half away on a speedboat from Koh Samui. There is a dive resort on the smallest of the three islands and expect this to be crowded with people learning to dive. The sea will also be very packed with people. What I loved about these islands is that they did not allow us to bring in any plastic bottles to avoid environmental concerns. But that also means you will have to buy your drinks on site, at high tourist prices. Do climb up to the viewpoint to have the famous view over the three islands but be sure to bring proper shoes as the last part of the trek involves climbing over boulders. At both locations you can snorkel and enjoy a day at sea. Since this is your last night on the island you should enjoy a sunset drink, if you have time to arrive back at your hotel on time, and a fine dining dinner deserving of Koh Samui’s pedigree. If you still have a few hours to kill on your last day you can wander around the Fisherman Village of Bophut and drive past the airport into Wat Phra Yai or Big Buddha. This is one of the few working temples in Koh Samui so remember to cover legs and shoulders. The Buddha stands shinny gold high atop a set of stairs. Have you been to Koh Samui? Did you see or go anywhere else that you would add into the itinerary?